Josep Serra (not to be confused with the la Vinyeta one) has in his possession two very nice vineyards that he bought back in 1998 which are located within the boundaries of the Capçanes village. Planted back in 1940, these are not big parcels, planted to 50% Grenache, 35% Hairy Grenache, and 15% Carignan. Given their dimensions and small production, he chooses to make one single wine from them, which is to my knowledge the only wine produced in his Serra Barceló cellar. When I was researching the Montsant wine guide, Josep’s cellar was one that I almost couldn’t find, tucked away in a corner of the small village of Els Guiamets. More cellars have popped up there in recent years however such as Cal Bessó and La Plaçeta which is only fitting as the territory has a lot of potential as is the case with much of southern DO Montsant. The majority of grapes are still being fed into the remaining cooperatives but slowly they’ll getting pulled out and we’re seeing new projects emerge. Josep’s vineyards are very limestone rich and he’s even found a number of fossils in them that he brings to tastings. This is of course the point we get to in that he did a vertical tasting of his last five vintages at Vins i Olis in Falset, Priorat two weeks back. From time to time the owner, Marc Aguiló will have a local winemaker come in to do something more interesting than just the regular sales pitch of his or her wines and so we get to taste through something unique. Those of us in attendance usually end up buying cheeses from Marc’s heady selection he stocks. I can’t help myself. Cheese is just delicious. 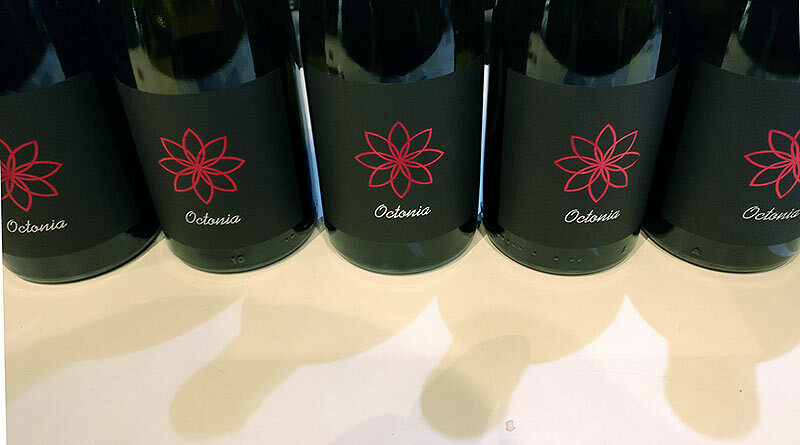 What’s curious about Josep’s wine, Octònia is that he keeps the blend essentially the same every year, basically using everything good that comes in from the vineyard. As his more income-positive job (micro wineries are a thing of passion) is that of a consultant, he’s often experimenting in one form or another with these personal wines. He’s given anywhere from 18-30 months of total aging which had started out fully in oak and in recent times has drifted towards clay and cement. This shouldn’t come as a shock as the wines of both DOQ Priorat and DO Montsant are rarely lacking for concentration and most cellars are doing trials or have fully moved to more neutral aging. This is a very good thing as the 2009, I had actually tasted a few days earlier in Barcelona as part of a White Grenache tasting and a woman to my said was simply exuberant about the wine which I found to be quite massive. Taste is subjective and that was a hot vintage but it seems that Josep felt the same way as the wine has gotten more mellow and integrated with time. I still feel that there’s a more dialing back that could be done but it’s a definite change from what I first tasted back in 2013. Light ruby with light rim evolution. Cured strawberries, cedar, bready notes, white pepper, mushroom. Crisp red fruit notes, spicy notes, still quite high tannins, with medium length finish. Older style for the region. Could stand to have a great deal more aging. Extremely compact still. Very light ruby. Mint, fennel, cured red cherry and racy red fruits overall. Touch of reduction as well. Broad and rich on the palate with more dark fruit. Savory, good integration, spiciness in the finish. Medium ruby. Cedar, flambeed strawberries, mint, sage, black pepper, dark cured cherries. Big fat mix of red and dark fruits on the palate, bit empty in the middle and the finish. Medium acidity. Good point now but definitely falling off. Dropped to 20% of new oak this year. Ruby with brick rim. Balsamic, orange peel, light red cherry, touch of violet, licorice. Rich and integrated on the palate but with medium acidity and a shortish finish but holds lovely light strawberry notes. TCA first bottle. Cranberry, crisp fresh strawberry, licorice, light Mediterranean herbs, crisp in the nose. Full rich fruit on the mouth, bit of spiciness but good level of acidity that gives a lingering finished. Excellent life ahead of it.